Prime rib has become a New Year’s Eve tradition at our house. So much so that I started craving it a good two weeks ago. While researching recipes, I ran across Michael Ruhlman’s grill/roast method. 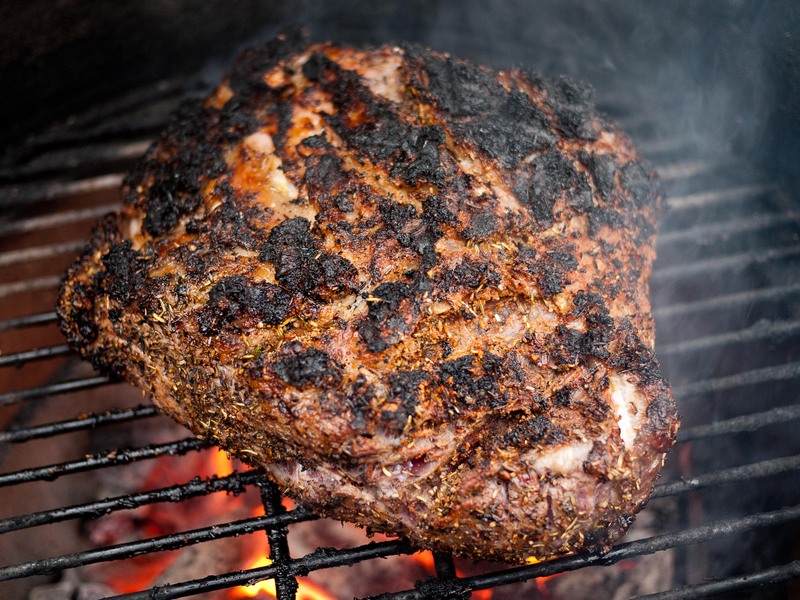 It involves searing the roast on the grill, letting it rest, and then finishing it in the oven. We had plans to go see a comedy show with friends, so the goal was to have all the prepping and searing done in advance and quickly finish it when we got home. Prepping the roast started on New Year’s Eve eve. First I scored the fat cap (deckle) on the roast, making shallow diagonal cuts in a diamond pattern at about 1-inch intervals. Then I combined the salt and spices to make a rub inspired by Mrs. O’Leary’s Cow Crust from AmazingRibs. I put the roast into a jelly roll pan and start working the rub into the meat, making sure to get it into the slashes in the deckle – sprinkling, rubbing, rolling, and repeating to coat all the sides. Working over a 6-pound hunk of meat is not the time to be shy. I picked up any rub that had fallen off by bouncing the roast against it, making manly grunting sounds as needed ;). When the roast was heavily crusted with rub, I moved it to a rack set over a roasting pan, and then moved the whole works to the fridge, letting the roast sit uncovered overnight. On New Year’s Eve afternoon, I removed the roast from the fridge and let it sit out while I fired the Big Green Egg up to nuclear temps – 800°F on the dome thermometer, meaning the grate was probably about 1000°F. I took the roast off the rack and seared it on the grate for 2 minutes on each side (considering this was a $50 piece of meat, those were some of the longest 4 minutes of my life). I removed the roast to the rack and closed the vents on the BGE to reduce the heat to 500°F. I put the roast back on the grate for another 2 more minutes on each side. I moved the roast back to the rack and inserted a Maverick remote thermometer. While the outside was wonderfully crispy, the internal temp was only 42°F (about air temp). I stashed the roast in the garage with a disposable drip pan as a cover and went inside to get ready for our guests. By the time we were ready to leave for the show, the internal temp had risen to 75°F. When we returned it had dropped to 60°F. I let the oven heat to 300°F, added about a cup of water to the roasting pan to keep the juices from burning, and put the roast on the middle rack of the oven to finishing cooking. I hear you, but it’s perfectly okay. While I wouldn’t do this with ground meat, the inside of a roast is largely a sterile environment. 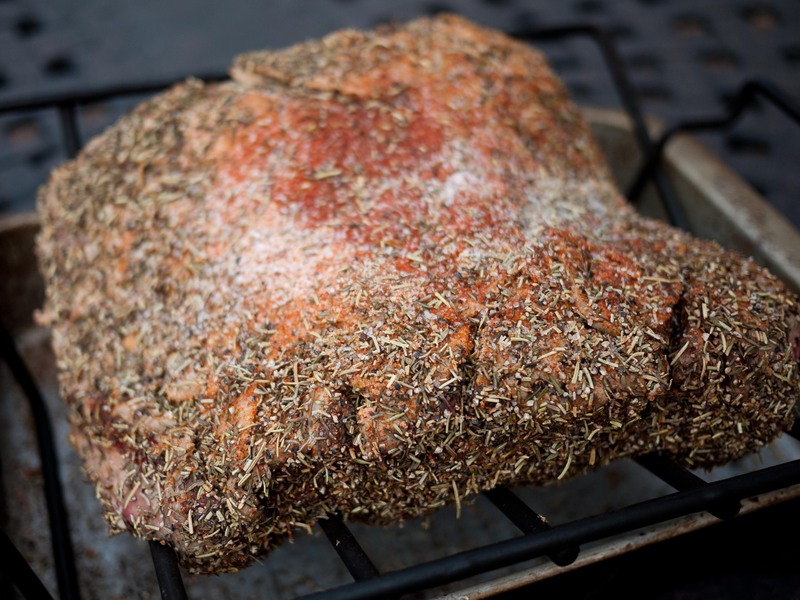 Any nasties that get on the meat in the fridge are not going to grow because of the cold and the salt in the rub. Searing kills anything on the meat, and 4 hours in a unheated garage in a northern climate is pretty much the same as storing it for that long in the fridge. Yes, the internal temp is 75°F, but there’s no way for anything to contaminate the inside, and finishing it in the oven again kills off anything on the outside that might give you the gleep. It took 2 1/2 very long hours for the roast to hit 125°F internal (good thing for appetizers, wine and great conversation!). I removed it from the rack and let it rest, covered, on a cutting board for 20 minutes while I made the Yorkshire pudding. While it was midnight before the meal hit the table, our hungry (and extremely patient) friends said that it was well worth the wait. I gotta agree – the crust was thick and tasty with lots of salt and herbs while the inside was an almost perfect rosy rare. But while the food was a hit, the timing was amiss. The show ran longer than we expected and that not only meant that the roast was late getting in the oven, but that it took longer to cook because its internal temp had dropped. Prime rib does taste wonderful with champagne, but I don’t think dining at midnight is going to become a tradition around here. The Nutrition: Meals like this are the reason people make resolutions. Make it a great new year! It may have been late but that is one heck of a midnight snack! 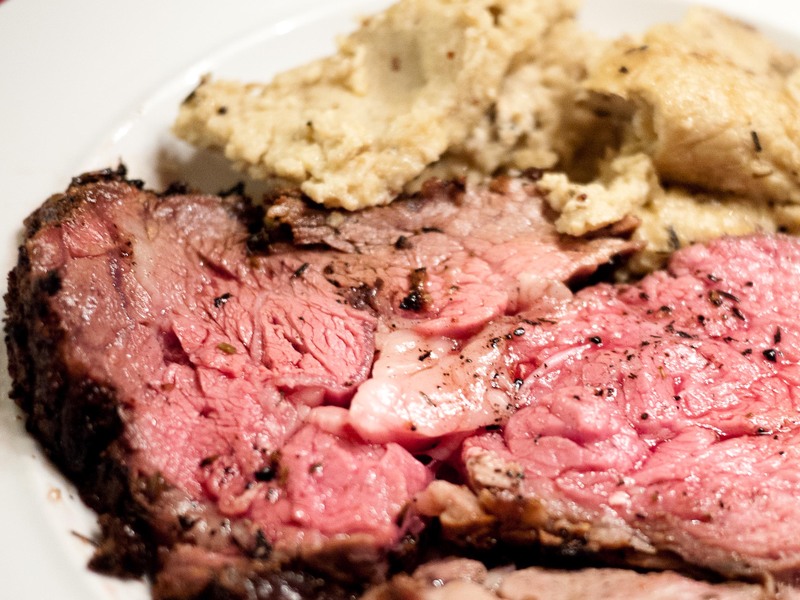 Beef roasts are one of my favorite holiday foods, in fact, probably THE favorite. 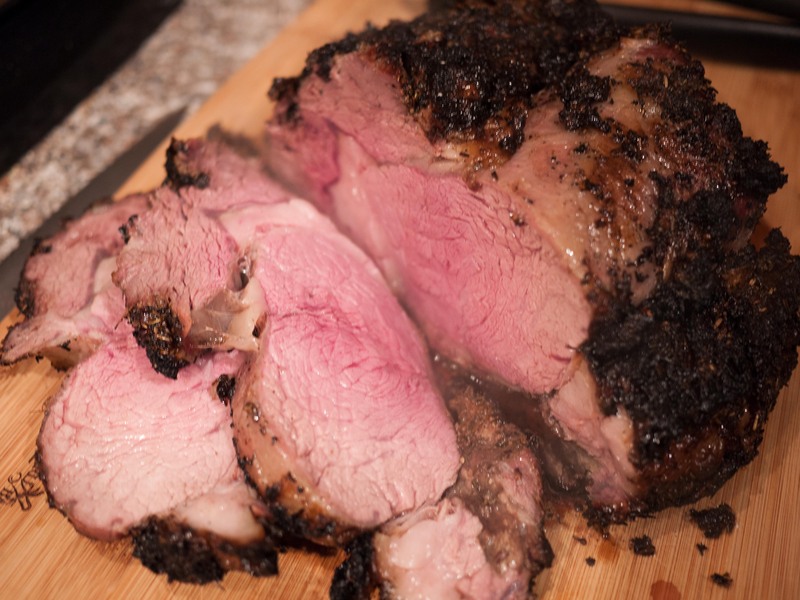 I had the Prime Rib Roast cravings a whole month before New Years. We placed our order from a local butcher to be sure to get a prime, prime rib. Your roast looks bloody delicious. I almost enjoy the sandwiches as much as the meal. Great job!